Fishing Trips all year from £50 per person. Specialist Bass and Wreck Fishing Trips from £90 per person. East Coast Fishing Trips, our new purpose built web site for Recreational Sea Fishing off the Suffolk coast, based in Lowestoft. We’re Wood Marine Ltd. and we are Lowestofts’ #1 provider of Sea Fishing Trips and Sea Fishing Charters. We’ve been providing exhilarating Lowestoft Fishing Trips for Sea Anglers for over 30 years. Whether you’re an Amateur, Pro or complete Novice. You’re in safe, effective and very experienced hands. 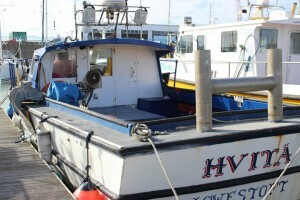 We have a number of boats in our fleet: Hvita, Pioneer and Lowestoft Provider. Sea Fishing Trips – £50 per person on HVITA (Available Friday, Saturday & Sunday). Sea Fishing Trips – £65 per person on PIONEER (Available Friday, Saturday & Sunday). Our Sea Fishing Charters start at £500 per day. (Available Every Day). NOTE: This is NOT a Fishing Charter. There may be a 2nd group on board. Both the Hvita & Pioneer are available for Private Groups and Corporate Events. Absolutely no experience is necessary and we supply all the gear including rods, tackle & bait. You just bring enthusiasm. Our standard Sea Fishing Charters can be booked online here. We also offer Bass Fishing Charters, Wreck Fishing Charters and Dive Charters. These can’t be booked online. You’ll need to call the Skipper or contact us.